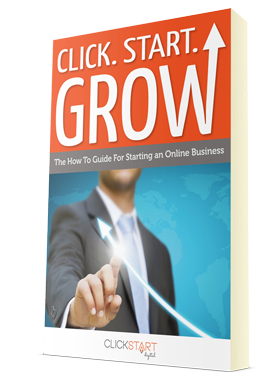 Learn How To Start a Business With Our Click Start Grow eBook! Build a better future, build your own business! Save yourself years of research & thousands of dollars, access the step by step express business guide & get your new business set up, seamlessly. Follow the simple steps of planning, funding, branding and marketing and ensure you have all of the right information before you embark on starting a new business. PLEASE NOTE: This is an express guide, and will teach you how to get a business set up quickly. With our eBook you receive one of the best business plan templates available. A business plan allows you to strategise your business concept from creation to completion, it is also an essential tool if you are going to finance your business. Ensuring your business is registered correctly will save you thousands of $$ and will alleviate potential legal issues later on. We give you brief advice on how to get your business set up quickly in America. Do you have a great business idea but you don’t have the finance to start it? We provide several solutions for financing your new endeavour including venture capital, bank loans and more. With so many social media platforms available to us, how do you choose the right one to promote your new business? We explain the pros and cons with each platform so you can make the right decision on which ones are the right fit for your business. We explain to you all of the Google tools you can use for your business. Learn what to do to get your business showing up the top of Google (for free! ), spy on competitors and analyse your website traffic to boost sales, convert customers & grow your business quickly! Marketing is the most important factor in any business. There is no point having a great business idea, but having no idea on how you are going to monetise it and market it. We give you a marketing 101 guide to put you on the right track to create a flourishing business. Click Starts how to start a business guide provides links to a host of invaluable information and resources, unlike so many guides out there all of the information is relevant to the Australian market. The business template included in the guide is fantastic - I used this to develop a thorough business plan which has impressed everyone I've shared it with so far. Your inside-knowledge and contacts have helped me so much and I am very grateful. The checklist of steps was great and everything would have taken ten times as long to work out on my own.